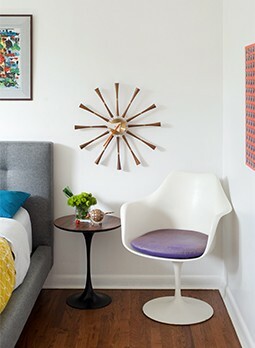 “We love Midcentury Modern design, but more importantly we love good design. This house is very well designed with its location, style, privacy and beautiful views. It perfectly embodies the spirit of the era.” They purchased the house in 2015 and set out to renovate the property over the course of the next 18 months. The intended changes were minimal, as the building was well maintained by the family that inhabited it for several decades before Cord and Alfonso moved in. “We are grateful that they were good stewards for the first 50 years of the home’s life. Even with children running around! Some original fixtures still looked like new with hardly any wear,” he says. The clerestory windows sit just below this and illuminate the interior. Beneath the clerestory windows, a series of beams support a lower, partially open ceiling that acted as a catwalk while Cord and Alfonso installed the Indow inserts. The homeowners focused on upgrading the building’s livability and preserving its integrity for years to come. Cord’s first priority was to update the home’s “thermal performance” so the internal temperature would be well regulated without wasting energy. The clerestory windows placed above the main living areas permit plenty of natural light to flood the interior, but they also leave it susceptible to uncomfortable temperatures and expensive electricity bills. 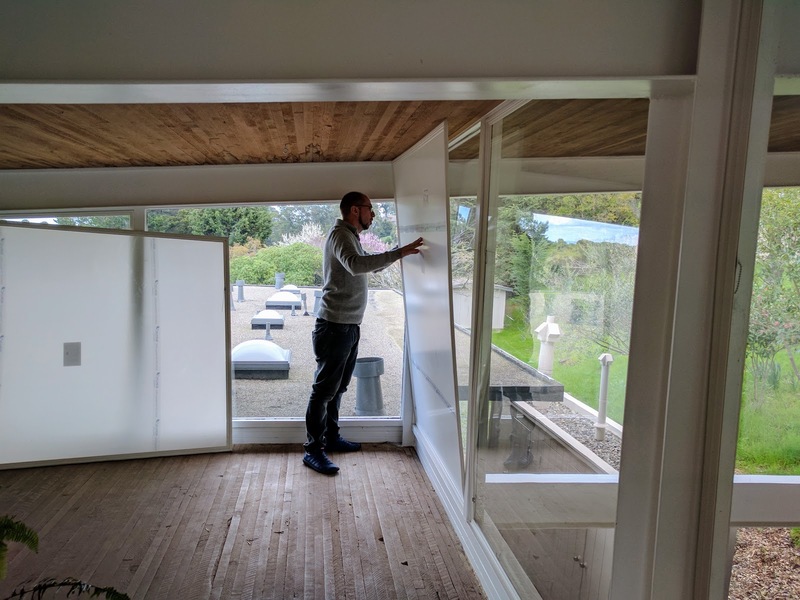 Case Study House #26 may be one of a kind, but such temperature issues are quite common in historic homes, and these problems leave many homeowners at a crossroad between preservation and comfort. Replacing the windows was not an option. The panes in #26 today are same the glass panes that were positioned into their unique casings during construction. The home is so well designed and cared for that the glass has never broken or fractured. Cord also considered that new glass typically has a green tinge to it that would not match the original glass in the rest of the house, and would therefore undermine the building’s visual consistency. To preserve the original crystal-clear glass and minimize wasted energy, Cord turned to Indow Windows. Measure twice, then install. The acrylic panels are covered in a protective film to avoid scratches or fingerprints until they are installed. The installation process is a simple matter of lining up the angles and removing the film. Once in place, the inserts will blend seamlessly into the current window casings. 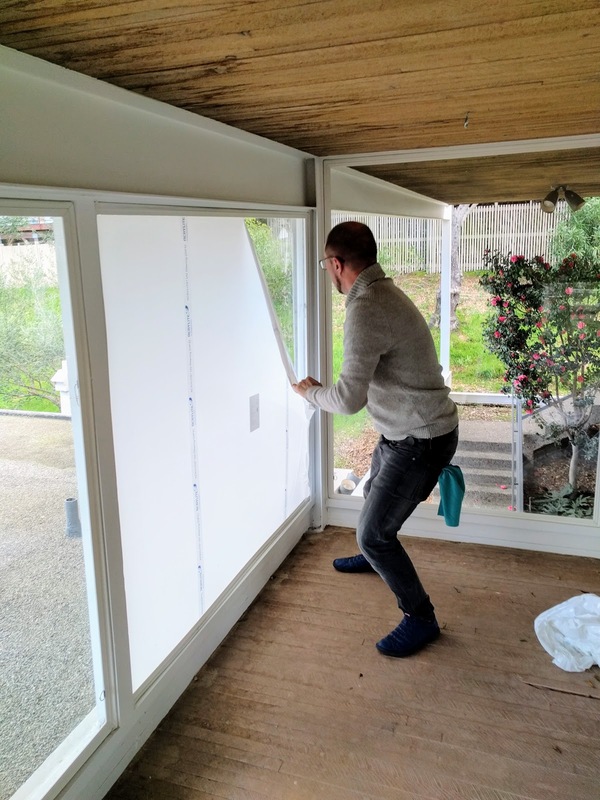 Indow Windows produces made-to-measure acrylic window inserts as an economic alter- native to the invasive process of removing old windows and installing newer alternatives. Similar, but superior, to double paned glass windows, Indow inserts are designed to improve insulation, increase privacy and reduce noise. Cord chose the company’s Museum Grade mod- el, which is also designed to provide protection against harmful UV rays that can fade colors and damage artwork. Most importantly, the inserts do not hinder the view outside or change the quality of light that comes inside. “I was impressed by how easy the installation process was,” Cord says. “It was quick, with minimal risk, and they will be easy to remove too.” Ever considerate of the building’s integrity, Cord did not want to permanently alter the original features if he could avoid it. “We don’t want to live in a museum,” he explains. “It’s our home, but we want to protect things so the next generation of homeowners can enjoy it and make their own decisions.” He plans to keep #26 with the same care as the family who lived there before, but Cord and his partner will certainly enjoy more comfortable temperatures. 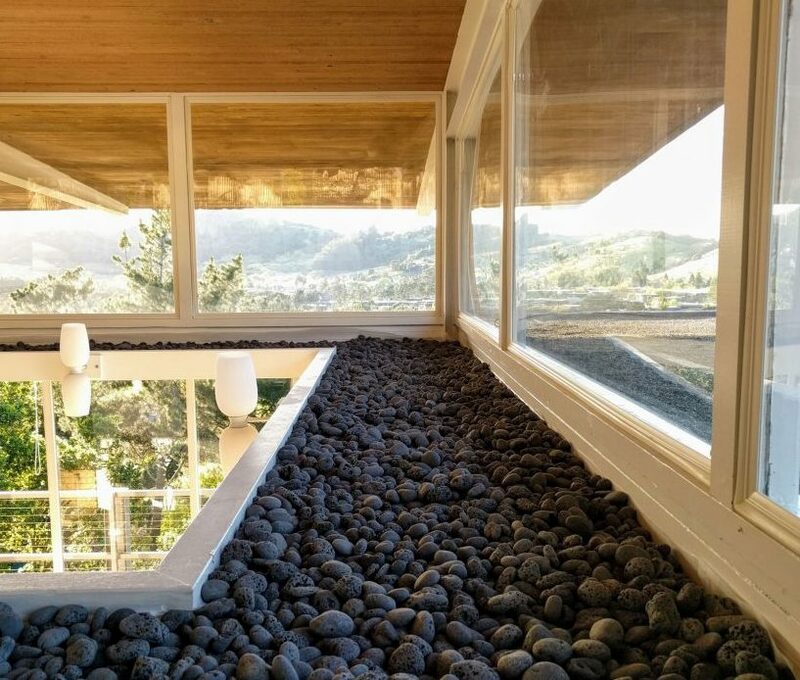 After installation, the partial ceiling was filled with lava rock to add texture. Between 1945 and 1966, democratic design was put to the test in the experimental homes of the Case Study Project. Arts & Architecture Magazine, together with Bethlehem Steel, commissioned a handful of the era’s foremost designers such as Ray and Charles Eames and Richard Neutra to plan and build pioneering residential housing. These houses would be glimpses of the future, born of wartime industrial techniques but then turned free into art. Case Study Houses would pursue forward-thinking innovation in a way that honored simplicity of form and quality materials. Overall, about 36 houses were designed and most of that number became physical properties that tested the high ideals of their purpose. Eventually, however, the buildings with their characteristic steel frames proved too costly to replicate en masse, and industry standards for accessible real estate went in a direction that could quickly accommodate the demands of a booming suburban population. 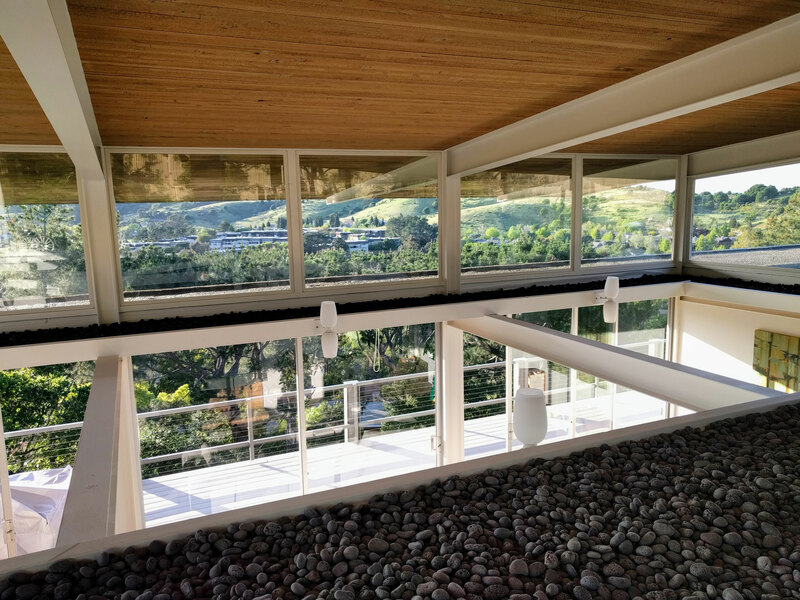 Today, the Case Study houses are rare treasures of the atomic era. Visit indowwindows.com for more on these window inserts.